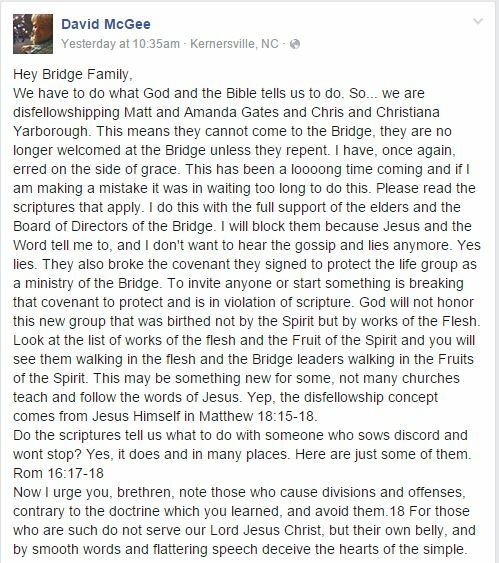 Pastor David McGee of The Bridge Church publicly excommunicated or disfellowshipped four members via his Facebook page. On Thursday, Pastor David McGee of The Bridge Fellowship in Kernersville, North Carolina, posted a comment on his Facebook account publicly naming and “disfollowshipping” four church members. I repeat – this was done PUBLICLY on Facebook, not in the context of a church meeting among church members. David continued with his comment by quoting about 30 – thirty, not 3, verses justifying his actions. Some of the verses were quoted in different translations and guess which verse was included? Of course Hebrews 13:17 (“Obey those who rule over you, and be submissive, for they watch out for your souls, as those who must give account.”), but take a look at the last verse quoted. Why do you supposed he ended with this verse? I like to dig a little bit when I read words. Do you see the contradiction in the following two comments by Pastor McGee? Take special note of the tithing references. The 2nd comment was posted 16 hours after the first comment. There were other comments claiming this was not really about tithing, but if it wasn’t about tithing, then why is it mentioned at all? Here you can see some pushback and then a member defends her pastor. I noticed the word “covenant” in this comment, but did not see a membership covenant at the church website. This little note is revealing. And 31 people liked it! Yea, it’s really important that your pastor has lots and lots of friends . . because that makes him right and reputable and all Christiany. Of course we do not know all of the details of this case and can only make conclusions based on what we see publicly. But what I see publicly is troubling. I have heard of stories where church members have been abusive to pastors. We often talk only about abusive leaders, but that is not always the case. Even if members are abusive, we need to ask how does a shepherd appropriately handle members who are divisive? If Pastor McGee is correct in saying that these folks have been divisive, how should a pastor respond? Do you see godly fruit in the behavior? Previous postDo you feel guilty because of pressure and high expectations from church leaders? You are not alone! On his FB page. That was humble and discreet. NOT!! I do see deacons and elders in the Word, I don’t fine the Board of Directors anywhere. I in no way believe that church covenants should be a thing, much less a requisite for being a part of a local community. I gather these people were pointing out problems in leadership and that is what he was calling creating discord? It is good news for those that were put out of the organization. From what little I see, this is not a part of the church. I may not know what the issues are but I know when someone sounds like an eighth-grader. Right, Marsha? And it doesn’t even take a sociology degree to figure that out! I think this arrogant punk of a pastor just made a huge legal mistake. When he went on the Internet disminiataing the matter to a wider demographic he gave the impression that he was intending to disparage these couples. I believe whatever legal protection a “covenant agreement” affords the church ( which is doubtful from the start) just got blown out of the water with Mr. Mcgee’s childlike stunt. He was obviously intending to scare people into silence and into tithing. We are told in the New Testament not to give under compulsion. Well if we really believe that, why do we allow pastors to attempt to compel us. Yet again we see a poorly trained, non- seminary grad running a church like it’s ” HIS CHURCH “. He took course with teen challenge, that’s his training. How do these clowns get by with this ? Do people that go to churches like this find a guy with a Black n Decker in the parking lot of Home Depo to fill their cavities ? They seem to be happy with a novice, immature guitarist as a pastor. Another thing that comes to mind is a 501c3 can have it’s tax exempt status revoked for disclosing contributors donations without permission. My guess is these couples quit giving to the Bridge after seeing the Pastor ‘s lifestyle and realizing that it’s a business NOT a ministry. Who would want to fellowship there, let alone tithe? The gleanings about the structure of this church seems reminiscent of Marc Driscoll’s. A life group contract? Really? Usually all these consist of is a promise to allow the other members to control you (like the shepherding system) and never to “gossip” about the group, which is code speak for “if you ever leave you better never have the unmitigated gall tell anyone outside this church about your complaints regarding the abuse.” That’s the same type contract Driscoll the plagurism pastor had in his small do-life groups. He too shamed his congregants for not tithing according to his expectations. In a healthy system the pastor would not know which congregants tithed over the past year because he would not do the book keeping. The fact he knows who tithed or didn’t is suspicious to me. I also felt sorry for the news agency he was jerking around. They had to work their schedule around the story and then he doesn’t “answer the phone.” Having been a reporter that left a bad taste in my mouth. I’m wondering how many pastors actually know their congregants’ tithing records. I find that odd. And then for him to publicly say to people outside of the church that these folks haven’t tithed for a year? That’s just nuts. Yea, is that illegal to publicly announce, I wonder? Yeah I thought that too, Cathryn. Like what is this little boy looking to hide. If you agree to an interview you do it, not sit there and stare at the ringing phone. Then the guy is dumb enough to tell that. He must figure his congregation is so dumb, they will accept anything. Probably true as this church started out as Calvary chapel of Triad, N.C. If you google the church there are threads going back years talking of affairs, drug use, strippers and the pastor’s multi-million dollar home. Just as the way of reminder to anyone thinking of formally joining a church, signing a covenant agreement, Life group contract or other agreement Daisy is on board offering free SNAP OUT OF IT smacks to the head. For those needing more intensive intervention we should think about one of those shock threatment things they used on Frankenstein. I also did some digging. McGee and the church have a Calvary Chapel history. Not sure why they left and changed their name, but they did. I also looked on three of the ex-members FB pages. It seems Matt Gates has shared the most on his page, but he did not go into detail there. “I uncovered much scandal and went to David McGee and was shunned” – Someone asked for info and he wouldn’t share on his FB page. It appears that at least the Gates family had already left The Bridge when the pastor wrote that they were booted. If one can take at face value some of the comments I read, it appears that at some point in the future we could be hearing more about this church. Lois, that comment is excellent! 1. First, he acts like he is the Source and the Owner of the Vision. If you don’t know what I mean check out the excellent article, “Legitimate Vision”. 2. He travels but you don’t. It all about you helping him achieve “his Ministry”. He travels because he loves the worship given to Americans in third world countries. 3. He is not a Gatekeeper; he is more like a Prison warden. No one has permission to go anywhere except where he says, when he says. 4. He refuses to release the people to God’s call in their life. He talks a good talk, but reality is there is a human junkyard of those he has blacklisted. 5. He is always training you for ministry but you never graduate because you never quite measure up. The truth is he is only interested in spectators for His next Wow-teaching. It’s a power trip! He “needs” to be heard. 6. The only legitimate ministry is that which is hyper-linked to him and to the name of his ministry. It’s about a name rather than about Jesus. 7. Maintains a strong Propaganda Network complete with spies, blacklists and a Pastor-Approved grapevine. 8. “Members” are dumbed down zombies who will never challenge his abuse and control. They are like “sheep to the slaughter”. They “need” him to like them. 9. People leave suddenly and those who leave are leaving hurt. They appear stunned for months and it takes them awhile to engage in ministry again. To avoid the fallout, especially if the person was liked in the congregation, the leader will begin an email smear campaign, direct his lieutenant zombies, and pronounce judgment on them. 10. Watch him carefully during worship! He cannot praise very long because he is too busy making sure he has his fingers into everything that is going on. He isn’t just serving in a ministry. The ministry is him and he is the ministry. Say you don’t like something and watch the contortion on his face. 11. No Tears! It’s like he is super human! He has an answer for everything. No Transparency. He leads a secret life with a short list of approved followers that he will allow near. 12. Finally, he is a ministry loner. His “friends” are not in this area. He has no relationship with peers who can get in his face. The only thing apostolic about him is the title he demands from others and puts on his self promotion. After reading this, some of you will say, I know exactly who he is talking about and why didn’t you just mention his name? The sad truth is that in the NE Florida area there are more than just a few leaders who operate like this. While there is “no shame in their game” I will not stoop to their level to call them out. They had better pray the Lord doesn’t give me the go ahead to call them out publicly someday. I thought the same thing, BDTD. BTW, in my former church group, it wouldn’t at all be unusual for the pastor to either know or easily find out who was tithing and who was not, as well as how much. Translation: But I’m not! I’m being the bigger person here. Go me! Translation: The fact that these ex-members want to be on the news shows they aren’t true Christians (TM). I get to set the standard for who is a true Christian (TM). T: The media didn’t have the decency to cancel the story when I declined to comment. It just proves they’re out to get me and can’t be trusted. T: All of this is beneath me anyway. I’m the authority, here. T: They’re not submitting to meeeee! T: See? God agrees that they are terrible people. T: You thought my FB post was shaming? I could have made it a whole lot worse. T: My refusal to comment to the big, bad media PROVES I am not spiteful. T: I’m awesome even without God. God just makes me 10,000 x more awesome. T: No need to question my interpretation of those words or the spirit in which I carry them out. T: Everyone under my authority agrees with me. T: This incident has hurt me so, so much. I’m the true victim here. T: See, isn’t it awful? Feel sorry for me. T: Ignore the fact that I hurt you. T: See, I actually did you a favor. My hurting you is an opportunity for you to grow spiritually. T: Jesus is just like me!! T: Now I’m feeling really pious. T: It’s all just an attack by the devil!!! Thank you, Billy, for sharing your experience. I also received information that there is a covenant for church leaders to sign and part of that is that leaders will regularly tithe to the church. April, would you like to be my freelance translator here? That was great! Ah. I love when people describe themselves – “warrior poet”? Really? That’s outta control ego right there. Yeah you’re sensitive, sensitive to your own ego and image. Without knowing any other details, McGee’s behavior makes his accusations suspect. Even if some members were being divisive (which is another vague, catchall term when there aren’t any specific charges), it is not appropriate to handle such business on a public FB page. The last Biblical step is to tell it to the church– not concoct a melodrama on FB with McGee as the starring protagonist. He also claims to be following Matthew 18 but never himself spoke to the people involved (that I know of). He would never lower himself to actually speak to these people directly. He always send his minions. No one can get near this guy without very special privilege. Even at the church he has security people around at all times. I would like to think that pastors would know better by now than to do things like this. I also would love to hope that everyone in that church would abandon ship before they’re the next ones to be called out. I visited their Facebook page. You will be loved if you attend their church. Loved, I say. If Nancy Pardo says so, it must be true. That is it, I am packing up my stuff and moving to North Carolina pronto! Baked Italian Penne, Fresh Rolls, Cheesecake, (and your choice of) Coke, Lemonade, or Water. Mmm, cheese cake. They serve cheesecake. Maybe we are being too hard on a church that serves cheese cake? And their sign says you can have a “Blessed Dining Experience” as you are eating your penne and cheesecake. Ah. I love when people describe themselves – “warrior poet”? He actually said that somewhere? That odd noise you hear is me, gagging over that. You are too funny!! Now I want cheesecake with chocolate syrup or chocolate cheesecake. Who the heck is Nancy Pardo??? By the way, how would they know if I am tithing or not? My money gets distributed as I feel the Lord leading. It doesn’t necessarily go to the church. This story is so hilariously stupid that I can’t even think of anything witty to say. David McGee, you’re a wuss. A PASTOR WITH SECURITY PEOPLE, HAHAHAHAHAHA… sorry, this is just awesome. I mean really, this is just too rich. Is this story a prank? This has to be some sort of prank. Ooh I assure you it’s very real. It was coming out of this church that led my internet search to this blog some years ago. Marie, I’m sorry for your experience and I hope you understand my jocularity. I’m not laughing at your hurt, I’m laughing at the sheer idiocy of a pastor claiming to be Christi-like and then employing a private security detail. That’s the funniest, stupidest thing I’ve ever heard. What a weasel. I am wondering where this pastor and others like him are coming from. Not from a holy calling or any place of holiness. Where is the Shephard who lays down his life for the sheep? There are so many false prophets among us. We as Christians need to study God’s Word for ourselves and trust The Holy Spirit within us to guide us. We do not need to depend on others to do this for us. I am probably a little older than most on this blog. When I was in Bible Study in the 70’s, 80’s and 90’s, we rigorously studied the Bible for up to 1O hours a week. We were taught to study to rightly divide the word of truth. Because if that training I can spot a false prophet a mile away. My husband and I have often not been the most popular people in the churches we have attended. You know, I remember newsreel footage of David Koresh playing guitar, and as I recall he sounded a lot like David McGee. I don’t think it’s a coincidence that the two of them sound equally unmusical. It’s absolutely delicious, it really is. There was a really wonderful man of God that I used to listen to in the 80’s. J, Vernon McGee. , I hope this David McGee is not related, Vernon would be spinning in his grave. Leslie, I used to work the night shift downtown Portland and because I was the only one there, I listened to J. Vernon McGee on the Christian radio station. This was in ’83-’84. I was thinking about him today as I typed David McGee’s name and wondered if they could be related and then quickly dismissed that idea. I really liked J. Vernon McGee. What a kind soul. In my decades of church attendance I have tithed above 10 %, and always in cash, lest anyone find out, like my left hand. My gifts are between God and me. I don’t ever deduct charitable contributions, because, well, they are GIFTS. I imagine there are like-minded individuals in every church, including the Bridge, so it should be impossible to verify that anyone has failed to tithe. No one knows who the cash donors are. They could be anybody. Also, I have listened to thousands of (mostly pointless) hours listening to sermons, and I have NEVEr heard 1 Timothy 5:19-20, wherein elders who err are to be rebuked publicly. Never seen it done, never heard it preached. I had to read it several times to make sure it wasn’t some kind of satire. At this rate, the Onion will soon find itself out of business. Man, this guy is a real piece of work. After reading through all of the comments on Facebook, there really is no valid reason for why these folks are being called out in this way. There is no way to leave a comment on Facebook. I’m guessing that the only people who can leave comments are those who are friends with him. He claims that this is not about tithing but about how these folks caused “division.” He has not clarified what this “division” is. And, those who are defending McGee and claim to know what happened aren’t saying what that “division” is either. And, in one thread he deleted the comments by one person who tried to push back. All we have are his comments left on there, which is not good for him because it leaves people to wonder what kinds of questions were asked. Like I said before, if I were attending there I might think twice. I know he did have comments open at one point. I saw that Chris Rosebrough left questions asking what they had done to deserve this. There were also more pushback comments. It seems they are outnumbered now by defenders. I’d like to hope that the current members would think twice about remaining there after this, but I wouldn’t plan on it. Most of the time, members will buy whatever story the “pastor” is peddling. Then one day . . . it happens to them. Then they’ll suddenly find renewed interest in other survivor’s stories. I know, because I did the same thing in my former cult. After watching McGee play on you tube, I gotta be fair and honest here. He ain’t no Stephen Stills*, but then again I don’t think he’s a ‘wanker’ either. Music aside, the thing that tipped the scales for me about the Bridge was its Calvary Chapel DNA. I got reeled into the Calvary Chapel cult as a young Army vet in Southern Calif. back during the Vietnam Era. How I survived almost 15 years of their stultifying and authoritarian nonsense is a testament to the human spirit. I bless Providence that I’m free of all that horse$hit. *Stills first showed his mettle as an acoustic guitar virtuoso in the song Bluebird done with the old Buffalo Springfield in 1967. @Muff Potter- David McGee is a bad, bad guitar player. I’ve known 10-year-olds who played like him, and yeah, everyone was duly impressed… because they were *10 years old. * Fortunately those kids kept taking lessons and learned how to actually play. David McGee’s picking is sloppy, his tone is fingernails on a chalkboard, his rhythm is baffling, his bends sound like a dying hyena, his note choices are out-of-key half the time, and his sense of melody is absolute zero. His playing is an insult and an affront to professional guitarists the world over. I’m beginning to believe the guy became a pastor because he discovered he was never going to make it as a rock star with his crap playing, and in desperation he started preaching in an effort to con people into listening to his execrable guitar noises. Trust me on this, my friend: David McGee is *bad*. He’s not at all musical. This discussion highlights the whole problem with these egotistical charismatic snake-oil preachers: If someone declares himself to be “PREACHIN THE WORD OF JEEZUS” then suddenly, no matter what a scumbag that person may visibly be, the evangelical community *immediately* snatches those people up and sets them on a high pedestal, out of reach of any and all question or criticism, and vigorously and emotionally defends that person on the basis of “the message.” No. No, no, no. I’m tired of this transparent buffoonery. If a man sets himself up to be a musician as well as a pastor, let him be subject to the same level of professional expectations as everybody else. 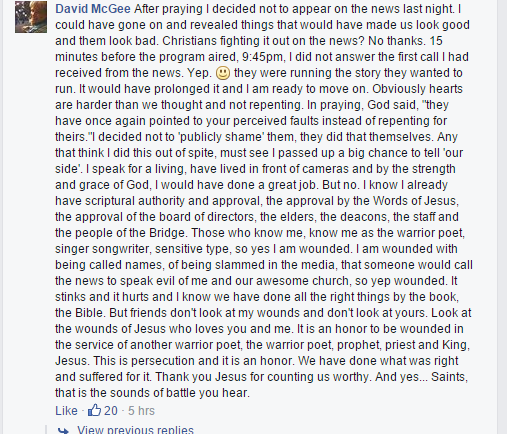 David McGee does not get a free pass for his horrible musicianship just because he’s an evangelical preacher. The man is a horrendous musician. I’d sooner listen to a car accident. I have really been praying about the disturbing things going on at this church since the bond offering for the new building (when it was still Calvary Chapel) and I read the financial info and how much his housing allowance was, etc. That is when we left the church. At the time I only knew he lived in a house worth in the 200k range, but recently I looked up the tax records and realized he also owns a house worth over 800k. All this coming out is really an answer to prayer. Maybe now his kingdom will crumble, I feel so bad for all the people who have invested in the bonds and the church. In the beginning of our going there about 10 years ago we were deceived and caught up in all of it. It has been extremely grieving to my family, we even moved here so we could attend this church. The person who needs to repent is David McGee. The worst thing is it gives non believers another reason to mock Christianity. I live in NC and have had dealings with Pastor David McGee that I can’t go public with until Dec 10. But some information that is publicly available and already discussed on the Internet is that he has 3 armed bodyguards with him when he is at the Church, lives in a 1.2 million dollar home, vacations in Key West with the president of Coca Cola bottling company who flies in on a private jet, and owns a gold Lexus. What these two couples did PALES in comparison to what I have in text messages and in pictures that he refuses to talk with me about. Well, it’s apparent why tithes are important to McGee even though he insists they aren’t. Sadly, these new revelations from former members are only underscoring what many have already observed in the public behavior shown recently. You cannot dismiss the patterns. They are so predictable when you’ve seen it a few times. I went and listened to him. You’re 100% right. I’ve only heard Keaggy once or twice, but I always forget to look into him more. Could you recommend some good tracks? Dash, you have me all misty-eyed listening to March of the Clouds. Phil Keaggy is one of my husband’s favorites. Fifteen years ago, while planning our wedding, he talked about me walking down the aisle to March of the Clouds. It was a little too . . . ummm . . . electric for our former church at that time. But, that song will always take me back to that time in my life. That kind of thing seems common in abusive churches. The person leaves and then the pastor says they’re kicked out or excommunicated for breaking the contract or whatever. One secretly purpose driven church we used to fellowship with had a membership contract that said if you left without giving some kind of notice you would later be kicked out automatically. We presumed it would probably be announced in a negative way when we left. We left when the pastor told me I was reading the Bible too much. Well, Cathryn, you really should not know more in the Bible than your pastor, doncha know?!!! ::::sarcasm:::: That is just plain silly. Good thing you left! Wow, really this is ridiculous. Anyone following this pastor would do good to wake up, as you all gathered to pray for his church this morning and then proceeded to air out more about these couples through another assisting pastor and then when your pastor came out on stage you stood up, clapped and cheered…. Y’all are just as responsible for why he acts the way he does, as he is never corrected for his behavior as his Facebook page (David McGee, Senior Pastor of the Bridge or wait he has another on; David McGee, teacher, oh and there is more Cross the bridge page for David McGee, keep digging people he has plenty of sites, Youtube, Twitter, One page, and he is sometimes hosted on a live call in radio show, 501-C listed as the bridge fellowship incorporated, formerly Calvary Chapel of the triad) is full of positive comments as he deletes all negative ones…. DO NOT WORSHIP IDOLS.. You have allowed him to become your god and no one is question him, ever….. The other couples have not posted anything to keep this going and yet (again, don’t trust me check them out too; Facebook Matt and Amanda Gates: once you friend them like I did; you can see that they have comments about this and are sharing their story, and Christina Yarbrough: once you friend her as I did, you will see her page is full of articles calling for revival and speaking of unity and love; neither couple seems to be doing anything publicly that they should have been called on out by a pastor as being lies, divisive, or damning to McGee… and check their twitter and other accounts as well) i did and you could do it in a few minutes, both couples deserve an apology, and fellow members fo the body of CHRIST, I call you to pray for the couples to be strong and to stand up for the one true GOD…. McGee with his delusions that he is a christian rock god keeps airing things out for the world to see, hiding behind scripture, remember people even the devil himself was slick enough to twist the scripture to bring us the fallen world we live in; Yes we live in a fallen world, where no one has the right to cast stones….. Wow, he can remain silent as his followers go about doing dastardly deeds to tear others down….. These couples spoke out against a man that has shown no proof just accusations….. yet, these people offer to answer all questions…. Who is hiding from the truth…. This is sad, and it doesn’t matter what these couples did to this man, he sure has a way of spinning things to make himself look like the victim. He has something to hide, that is why he will not face these couples himself…. it is all smoke and mirrors by this man to cover up something that will bring his worldly kingdom down. He is a magician not a pastor. He has these people under his evil spell, tithing isn’t the reason these couples were cast out of the church, it is because they refused to believe that McGee is perfect…. now McGee has cast such evil things at them, no one will believe a word that they have to say…Check your facts people…. According to his own testimony and a story written by Phil Cooke, he is a recovering addict that had a five hundred dollar habit…… The way he is acting, I would recommend his board members have him drug tested, and if needed placed back in another rehab program, and work on finding a new pastor and restructure the incorporation again. Mod note: added paragraphs for easier reading. I want to point out, for the record, that there is nothing inherently wrong with rock music. *All* music can be good and have a positive influence on people, up to and including extreme types of music such as rap and death metal. This distinction is important to me, as fraudulent teachers like Bill Gothard speak against rock music and that stance is as false as anything that David McGee is teaching. The problem with David McGee is not that he tries to play Christian rock, which is fine under most circumstances. The problem is that he’s so fundamentally *bad* at it. It’s an insult to his listeners. If you’re going to play at being a professional musician, you have to at LEAST give half-a-sh*t about your audience. David McGee obviously does not care what he assaults his listeners ears with. He doesn’t respect the craft of music enough to be any good at it. He’s using the guise of being a gospel preacher to garner himself a captive audience of parishioners who then *have* to sit still on Sunday morning and listen to his horrible caterwauling cat-in-a-back-alley awful electric guitar muck. David McGee does great discredit to music in general by being a useless, sucky guitar player; and he does even greater discredit to the cause of Christ by being a useless, sucky, con artist of a snake-oil preacher. If he was truly being honest about his musicianship, he would at least put on legitimate concerts and try to sell tickets, and then he would find out what everyone else already knows: he is such an awful musician that nobody is willing to pay good money to hear him perform. Free market rules, ladies and gentleman: if nobody will pay for something, then it’s probably worthless. As someone who used to be married to upper leadership at the highest levels, everything you HeLives just spoke about is 100% honest truth. I just wish I had the opportunity NOW to go public with what I have but can’t till Dec 10, 2015. But I can tell you that the media in Kernersville, NC needs to ramp up their investigation of The Bridge Church and Fellowship, along with Pastor David McGee. Unfortunately, this is a pastor led Church, and the two board members are good friends who will not call for a drug test, nor question him. Even with the information they KNOW I have which would make the national media, they remain arrogant. MS, I’m very intrigued in by what you claim to know. If there’s an actual date before which you’re not allowed to disclose, then that implies legal proceedings. This is very interesting indeed. May I also add that this is all just really, really sad. If David McGee actually does have a drug addiction, then wow. Who ever thought it would be a good idea for him to be a preacher? I mean, there’s a place for everyone in the body of Christ, but there’s a reason why recovering addicts are supposed to avoid high-pressure, high-profile, public image jobs. I just did a Yahoo search on David Mc Gee. Lots of not so good things have happened in the last couple of years. I encourage everyone to check it out. I can not even imagine a church where there are three armed bodyguards surrounding the pastor at all times. Scary but exciting times. Come quickly Lord Jesus. qQck interjection about “tithing records”, at the church i was at, before I moved. neither the pastor, nor the elders knew how much anyone gave. rather, only the bookkeeper and one of the deacons, specifically, knew what every one gave and in the bylaws they were not to tell the pastors or elders specifics, only a summary of the amount of total giving. ie, the church gave 900$ this Sunday.” They purposefully set it up this way so as to avoid all the problems that come with this sort of thing. I think it is most excellent. That’s a good point, Dustin, and you describe what I’ve experienced as well. Dustin, that is the way it should work. I saw Phil Keaggy a couple times back in the 90s. Was absolutely spellbinding, and I’ve seen some pretty good guitarists in concert, e.g., Eddie Van Halen, 1984 Tour. I’ll take PK over any of them. As an added bonus, he seems to be genuinely in love with Jesus, and even though he truly seems to be a warrior for Christ and a bona fide poet, unlike a fraud and phony like Mr. (not pastor) McGee, I can’t fathom him ever calling himself one. Having read some of McGee’s comments, he reeks of full blown NPD. Ugly stuff. The only causes for disfellowship, according to the Bible, are found in 1 Corinthians 6:9-11. And pastor McGee is guilty of one of those listed… extortion. When Mcgee teaches his congregation that God requires them to tithe their money to the church, and people respond by tithing their money, he has successfully extorted that money from them. Perhaps this “Board” he speaks of should disfellowship McGee as well. This “pastor” is a complete fraud and a wackjob if there ever was one. I would encourage everyone to go to his personal webpage by googling his name and watch the video on the main page. David along with his wife basically tell the story of their lives. Amazingly he led her to the LORD while LIVING WITH HER without bothering to get married. Here these two free love nitwits are traveling the world playing rock star / Jesus guy and cohabiting while “serving the Lord” with his one man Jesus show. Finally they got married, had kids and continued to travel sharing his testimony and playing his music. This guy was NEVER successful in the music business. He was an unknown, very easy research proves that. When you look at his glassy, baggy eyes you know right off this man is still using DRUGS. I was in a field were I dealt with drug addicts everyday, and this man is a user,GUARANTEED. His church has 2,000 people. So what ! That’s the BIBLE belt folks. I lived in NC for 18 months and the place is loaded with churches. Tons of churches with attendance of 3000-4000 or more. He is a self aggrandizing idiot that stretches the truth from day one of his story. The vast majority of what he says, well lets just say it doesn’t check out. Big shock huh ? Anyone with 45 minutes to spend checking this clown out will find he is a bogus carnival leader. Unfortunately that works in todays world. Christians have been dumbed down to the point of falling for anything. Even a carnival barker with Rolling Stone Dreams,and very little talent except as a BS artist. Nowhere can I find any reference to David McGee having any sort of higher education of any kind. There’s nothing about him attending a seminary, or getting a degree in religious studies, or having a divinity degree, or any educational background whatsoever that would qualify him to be a teacher of the Bible. What the hell, folks. Are you seriously telling me that over 2,000 people are attending a church led by a man with *zero* qualifications?? I’m at a loss for words. Would you go to see a doctor who didn’t have an M.D. or wasn’t board-certified? Would you be treated by a dentist who didn’t have a D.D.S. and didn’t have at least several dozen glowing recommendations from people with pearly-white, healthy teeth? Would you retain an attorney who had no J.D. and hadn’t passed the state bar? This is lunacy. How dare you brood of vipers (Matthew 12:34) say such rude and evil things about this man of God!!! I have personally experienced deception and hypocrisy in a few different churches and know when someone has selfish intentions. Pastor McGee is NOT one of them!!! I knew the moment I heard one of Pastor McGee sermons that the Lord had led me to a teacher who would help me grow in God’s word and who truly knew the heart of God. Unfortunately, I am not surprised this is happening because the enemy wants nothing more than to stop the lost from being saved. We are in the end times and Pastor McGee is bringing many to the Lord and helping others grow deeper in His word. Have you come to think that maybe he has no more ties with Calvary Chapel because he was against whatever they were accused of? Probably not because YOU are the evil ones who want to destroy and kill, just like the devil. Don’t forget judgement will come upon those who lead God’s sheep astray, including all of you who have left their nasty comments and rumors about this pastor. God’s word speaks about you in John 8:44 – You belong to your father, the devil, and you want to carry out your father’s desires. He was a murderer from the beginning, not holding to the truth, for there is no truth in him. When he lies, he speaks his native language, for he is a liar and the father of lies. I will pray for all involved, including your evil hearts and venomous mouths because God calls us to pray for our enemies. I will also pray for Pastor McGee who’s taught me so much about the Lord and God’s word. There are hardly any churches in California that teach word by word, chapter by chapter. Thanks Lord for Pastor McGee!!! Angela, you are a first time commenter, so I’m cutting you some slack. You do not get to call people names here. I was in a cult-like church and defended my pastor for a while, too. I’ve been receiving information and am very concerned. I’ve also been asking around to verify information and have received verification. I know it’s difficult when someone you trust is being talked about in a dishonoring way. Of course you want to defend. When everything comes out about McGee, I’m afraid it’s going to make you angry that he took advantage of you. This is going to be eye-opening for McGee supporters. It’s just a matter of time before everything is exposed. See you don’t really need McGee if you are in Him. Beware giving one man so much spiritual power over your soul. A “man of GOD” does not amass wealth from his church employment, as Mr. McGee apparently has. Paul worked as a blue collar laborer, a tent-builder, even though, unlike Mr. McGee, he had the most elite seminary training of his day (under the still-famous Gamaliel, who himself had been educated by the still-famous Hillel). Jesus had no place to lay his head. McGee apparently has two houses worth a total in excess of $1 million. Your reaction here shows me more than any disturbed, self-aggrandizing, strangely childish and petulant Facebook posts from Mr. McGee or accounts of abuse at the Bridge that Mr. McGee is leading a cult and that it will almost certainlt fall down on his head–as it ought. Angela, you need Jesus and you need to run from people like Mr. McGee. One more thought: Unless, of course, you are merely trolling and parodying the stereotypical cult follower. In which case I would say “Spot on, that was so absurd, so over-the-top, so wild eyed crazy, it was a brilliant performance.” But if you’re for real, please, lay aside the idol. Follow Jesus. truthdetector, she is real. Being in this Church I have seen first hand the idolatry she speaks. Pastor McGee’s face is everywhere, on books, advertising material, complete branding from the great Phil Cooke. beautiful assistants on their third marriages and seeking status and nobody in the Church can even see it. Jim Jones follower mentality. Oh, my. “Angela” is either a troll, someone with quite an interesting sense of humor, McGee himself under a pseudonym (and thinking himself very clever), or, saddest of all to contemplate, a true (blind, calling evil “good” and good “evil”) believer. As someone who isn’t too far removed from several cult environments, I remember thinking similar thoughts as Angela the first time I saw criticism of what I was a part of. I just hope she and others like her there will see the light one day, like I did. Very sad, then it’s just not Christianity. Seems the opposite. Not saying there aren’t Christians there, I’m sure there are (maybe even Angela, though she sounds more like who’d gulp the laced kool-aid, but who knows, I don’t know her and don’t know her past or what has led her to this), not saying the Bible isn’t being preached about, I suppose it is. Not even saying there isn’t power in that, even if it comes from one who is preaching for selfish motives. The Bible has power all alone, when flawed people tell stories about what Jesus said and did it has power. People can really come to know the Lord through it. Very, very dangerous stuff. Angela is proof of that, she acts like a pagan screaming because you toppled their idol over. It appears that their sin was to start a new “life group”, and perhaps not to trust church leadership with their tithes. Am I reading that correctly? Big contrast with how Paul dealt with Alexander–Paul was very terse about how the coppersmith had more or less spoken publicly against Paul’s preaching of the Gospel. Not many words, sadness…..
Another thought; those who note that Matthew 18 was not followed at all (let alone well) appear to be exactly right, and if you don’t trust church leadership with your offerings, it’s time to confront them and move on if necessary. If your pastor signs on a million dollar mortgage and gets bodyguards from the elders (instead of Roman authorities who did that for Paul), doubly so. And finally, regarding his guitar playing; I think he’s got “can move fingers and make notes fast” confused with “musical proficiency.” All too common–it reminds me of “I can Sing Higher”, a spoof of Sandi Patti by “Fresh Fish”, if I remember right. The blurbs I saw show moderate technical ability (except he can’t coordinate his right and left hands) with a complete lack of musical context. I’m pretty sure Angela is legitimate – just as legitimate as the folks who were bad mouthing my former abusing pastor to me in private and yet who remain to this day. Think about it like this. What has happened to those who spoke out? They are now getting publicly trashed. Now anyone who sits in the pews and who is having any doubts will have second thoughts about speaking out. Sometimes it’s just easier to sit in the pews on not rock the boat. Oh my. I must be living under a rock. I’m right here in the Piedmont Triad — a hop, skip, and jump away from Kernersville — and I’ve never even heard of Pastor McGee or the Bridge Church. LOL! What have I been missing all these years? But, then, I’m one of those clueless hellbound papists.The only “membership covenant” we have is called Baptism. Ok Ive been going to this church for several years and have enjoyed the teaching which up till now has been biblical not Cult like. you really do not need a degree to be biblicley sound. he does know the bible. I think once he purchased the larger church building he had to feed that puppy. money coming from the members of course. my problem with this is he went on a public forum to handle a private matter. over time it’s been all about the church and his ministry, his dream and we are all supposed to come along for the ride. In my opinion, he needs to apologize for His PART in this matter. As for the warrior poet crap. Sounds like he’s been drinking too much of his own koolaide. There is a lot of heresay in these post. David is probably not as good or as bad as he is being made out to be. as for me, I probably won’t be helping out at the church or donating unless he can man up and apologize for his part which is a biblical concept. Angela reminds me of Tony Miano and how he talks about folks who disagree with him. I do not mean that to be disrespectful or funny to Angela, but to compare because the talk is very similar. If you disagree, then you are seen as a hater. And we know where Miano goes with those who are “haters” of God’s people. They are the same as murderers and are worthy of hell. Hahahaha!! That was hysterical, DMK. I wonder where evangelicals got the idea that only Protestants are saved? Honestly, this whole fiasco reminds me of the Salem Witch Trials; and particularly of Giles Corey, who was crushed to death because he wouldn’t confess to being a witch. The laws at the time stated that if he confessed, he would be granted “mercy” and hanged (which was quick, and significantly less painful). The catch? His family would not be allowed to inherit his property. They would be beggared by the loving leaders who professed to know God. His last words were, purportedly, “More weight, more weight.” He loved his family enough to stand up to the leaders, and provide for them in the only way he could. Exactly my experiences at two churches. And the whistle blower comes to be seen as more the problem than the one doing the evil, sadistic things, because the narcissist/sadist in leadership is probably not going specifically after them, and since they’re sort of preaching from the Bible, they can be managed and the pew sitters can continue to have their “fellowship” and “friends” (I use quotes because such churches seldom spawn either true fellowship or friends), whereas the whistle blower forces the pew sitters to make hard choices that require some moral courage. The one who tells them the hard truth becomes the problem. Elie Wiesel wrote of when the first man came to his village and told them exactly what the German authorities were doing and were likely to come do to them–and how the community laughed him off, called him the problem. He was agitated, near hysterical, not someone to be believed. He was the problem, the one who was making them feel uncomfortable. And then they came and took the Wiesels and all their friends. The @idolexp in the tweet above is a hyperlink and you can see the tweets. “The Bridge” as in L Ron Hubbard’s “Bridge to Total Freedom”, i.e. Scientology? Think about it like this. What has happened to those who spoke out? They are now getting publicly trashed. Now anyone who sits in the pews and who is having any doubts will have second thoughts about speaking out. Make an Example of one, and a hundred will fall right into line. I’d like to state once again, for the record, that I am far more offended by Mr. McGee’s poor musicianship than I am offended by his hazy theology and financial misconduct. Imagine having to sit through his services, week after week, and listen to that noise. It makes my eyeballs twitch just thinking about it. @Dash, my first pastor used to make us sit through his vocal renditions of hymns by him and his wife on the piano, and he had no vocal skill at all. This feller would have been a musical treat to us. @Patrick Reece- I’ve never heard of an ordained minister with zero academic credentials, and under no circumstances would I ever consider attending a church led by such a man. Your defense of McGee- “you don’t need a degree to be Biblically sound”- is like saying “you don’t need to go to dental school to drill teeth.” No thanks. I want to hear from a preacher who is educated, literate, has studied Greek, Latin and Hebrew, understands the history of the King James Bible and the Dead Sea scrolls, and generally can be shown to be a responsible, well-informed humanitarian. You do a great discredit to the Gospels by approaching them as if all a self-appointed preacher needs by way of qualification is a great motivational speaking voice. Shared this post on reddit. One of the commenters is fixated on you, Julie Anne. Just change the topic! The Bible refers to skilled musicians in the Old Testament, so I think God does have high expectations for music and it’s something that I take very seriously when I’m playing the piano at church. I don’t want my playing to be a distraction for others during worship, but to be an extension of my own worship with congregants as we worship together. However, the Bible does not have musical qualifications for leaders or even academic qualifications. I have met some amazing pastors who do not have seminary degrees. I have met horrible pastors with seminary degrees who do not know how to shepherd. In this case, we have a guy who pretends to play music which is a distraction to real musicians who can see the difference. But we also have someone with a self-focus on image, who uses practices outside of the Bible, but claims they are Biblical for church governance. Not only that, there seems to be a lot of hypocrisy that will soon be uncovered. Although unskilled “musicians” can be like nails on a chalkboard, they don’t leave the same emotional damage that a spiritual abuser does. Spiritual abuse leaves lasting scars. I’m getting a lot of hits and also private messages on this situation. There will be more, trust me. Regarding the issues of music vs. preaching, and whether either musicians or pastors ought to be well trained, I think the Scripture leaves that open, especially in the New Testament. Certainly the Apostles did not have higher degrees (except for Paul), and just as certainly Paul writes in 1 Cor. 14 about everyone bringing a song for church. And yes, there were professionals around the Temple, but then the Psalmist tells us all to make that joyful noise. There are going to be some of us who can’t carry a tune even if the deacons give each of us a bucket, and that’s OK–though we ought to learn a touch just out of consideration for others, of course. And the damage? I’d actually argue that deliberately manipulative music can be a form of abuse. Think about it; all too often, we substitute technical skill for artistry, and we design music and sermons alike to manipulate, not to edify. Which is worse? Um, can I beg to have neither? I’m pointing out the education issues because I watched a number of Mr. McGee’s preaching videos, and the guy doesn’t seem to have a clue what he’s talking about. His interpretations of specific Bible verses are just strange and bizarre. I don’t think a seminary degree is the end-all be-all of qualifications, but without some sort of background in the dead languages there are a lot of translational pitfalls in both OT and NT that can result in divisive interpretations. A pastor should be educated enough to err on the side of caution. Look at it this way: There are lots of general practitioner M.D.’s who have terrible bedside manners. Some of them are jerks; some of them are power-tripping, “physician-as-God” narcissists, some of them don’t care about your problems, and some of them have faulty educations. When it comes to doctors, ultimately only *you* know what’s best for you and your body; a physician can only advise and prescribe. That said, I’m not about to abandon educated medicine to pursue homeopathy, or Riki healing, or holistic naturopathy, or any of that other quack garbage because I want *science* when I’m sick. Scientific medicine is where it’s at; that and modern nutrition and modern dentistry are why the average Western lifespan is over 70+ years now. So I’m going to hunt around until I find an educated doctor who I like. I’m not going to abandon modern medicine just because a lot of doctors are flawed. It’s the same with pastors, as far as I’m concerned. Sure, there are lots of educated pastors out there who are bad shepherds, but that doesn’t mean I’m going to abandon education as a criteria for a good pastor.